In one of our recent blogs, Industry Facing vs Client Facing: Picking the Right Voice, we talked about picking the right voice for your clients. While we briefly touched on identifying these clients, we also understand that it’s a critical part of your marketing plan that requires its own article. Not only to help you find your existing clients but also to find the ideal clients profiles (ICP) that can help expand your business both up in terms of income and to help you expand into new and exciting products and services. When you started your business, you saw a need that wasn’t being fulfilled and a way to sell your products or service to profit from it. When you were starting up, did you think about who exactly would buy your product? Thinking about who your clients are is a vital part of marketing, allowing you to produce messaging, imagery, and advertising that appeals to them. For most companies, both new and old, an ideal client is a combination of what has worked for them in the past and a jumping off point to the future. Let’s start with those. Who Currently Buys Your Products and Services? What do you know about the people who currently buy what you’re selling? While it may seem like a simple-to-answer question, you might be surprised what you find when you audit your sales or ask for info from your buyers and sales team. Depending on your industry, this could be simple demographics for fixed-cost hospitality to yearly business incomes for more B2B industries. Of These Current Customers, Which are Your Highest ROI? Narrowing down future ICPs can also be about finding what current clients provide the highest ROI (Return On Investment) and focusing on them. Your most frequent client may not be your most profitable. For example, a restaurant’s alcohol sales tend to have a higher margin than food, so those customers who buy bar items alongside their dinners have a higher return for you. Who Could Buy Your Products and Services? Getting that data can help you find out where you’re succeeding, but also ICPs adjacent to your current buyers that you’re simply not marketing to. 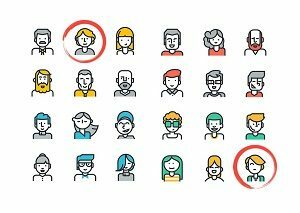 A simple example is one you’ve already seen done in many rebranding campaigns: expanding messaging and graphics to include a wider group of individuals of different genders, ages, races, and cultures. More advanced data includes segmenting products and services to target specific groups, like a car company that releases both economy and luxury models of the same car. Demographics: What are the base statistics of your client? These can include (or not include) things like their age, marital status, if they have children, and race to name a few. Income: This could be for an individual, family unit, or a company for more commercial services. Interests: What do your customers like? Where do their interests overlap with your products and services? How They Will Find You: It’s also important to know how they discover services and products like yours. Mobile device or desktop? TV or YouTube? Know how you can reach them with your marketing. Okay, so have some idea of a client profile? Now it’s time to be able to target them with marketing, advertising, and more. Here are some tips to get you started. Buying Decisions: Where do your ICPs make their buying decisions? This can be on what level (such as targeting CEOs of ICP businesses), but also where to market or advertising to them, such as on Google, listing services, or social media. Knowing Their Goals: What are the goals of your ICP, and how can they use your products or services to reach them? Where do your services and their needs meet? Branding Yourself: Once you’ve identified ICPs, it’s time to start speaking their language. Make sure your website and online presence use the terminology and SEO keywords they do. ICP Marketing: Knowing the marketing for the various industries is vital, from known who is on social media, to be able to devote parts of your website to show you are an industry leader in the service they need. Need help finding and marketing to your ideal client? From marketing planning to branding with website and logo reworks to simply helping you establish and expand your online presence through SEO, social media, and online advertising: it’s time to contact Vision Advertising. We’re a full-service marketing agency, specializing in comprehensive internet marketing – from websites to social media and everything in-between. Contact us today to start the discussion and find out if partnering with our digital marketing agency is right for you. How Blogs on Your Website Equal More Website Visits<< >>Just How Important is Mobile Marketing to Your Business?